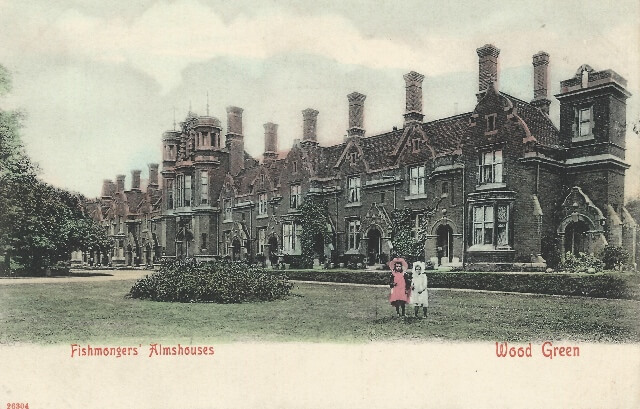 During the 19th century Wood Green was chosen as the new location for the almshouses of the Fishmongers’ and Poulterers’ Livery Company, moving them from the crowded City of London to the then cleaner and quieter environment of Wood Green. This Livery Company, one of the twelve great City of London Livery Companies, built a range of almshouses on the High Road just north of St Michael’s Church and opposite White Hart Lane. Its aims were philanthropic and practical; to help those suffering sickness and poverty by putting a roof over their heads. The foundation stone of the new almshouses was laid by Lord Morpeth on 25 June 1847. They were designed by Alfred Mee and William Webb with a central turreted gateway. Provision was made for twelve married couples. The almshouses opened in 1849. They survived as a well known landmark until they were demolished in the mid-20th century. The almshouses were demolished in 1955 to make way for Wood Green Civic Centre, designed by Sir John Brown, A E Hewson & Partners. This building was very different from the former Victorian Wood Green town hall in nearby Woodside House. The new civic centre opened on 15 March 1958. 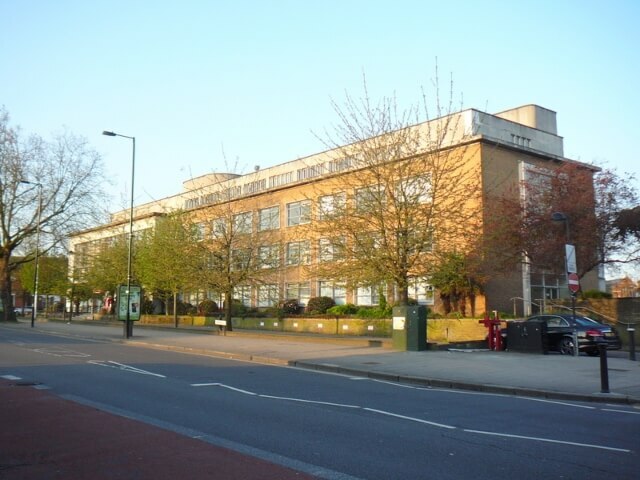 This building became Haringey Civic Centre when the old boroughs of Hornsey, Wood Green and Tottenham amalgamated in 1965 to become the London Borough of Haringey. Most council meetings are held here. Births and deaths which occur in Haringey have to be registered here, weddings and civil partnerships take place in its rooms, the Nationality Checking Service (NCS) resides in this building and the public can research the indexes of births, deaths, marriages and civil partnerships also. So a number of buildings with very different purposes have stood on this site.